As one of the leading building components manufacturer and supplier, we are at the forefront of technology and innovation, delivering superior quality solutions with maximized cost efficiencies. R-Group is a Finnish leading global supplier of precast accessories and concrete connections. R-Group with its global brand of RSTEEL® provides high-quality steel solutions for safe, reliable and enduring structures, throughout the world. Thriving on leading-edge technology, exceptional quality, excellent customer-oriented service, and a trusted network of suppliers, we offer standard and customized solutions to all small, medium and large scale companies globally. In our operations we comply with the ISO 9001:2015 and 14001:2015 standards. Our solutions have inspired the confidence of our clients and have helped us build a niche in precast and cast-in-situ construction industry. RSTEEL® has worked with a number of Finnish and international companies for many years, some of them for over a decade. We go out of the way in providing the best version of what our clients require. We believe in building connections that last and our unwavering commitment towards this goal sets us apart. We provide a wide range of precast accessories and concrete connections to our customers to help them build Safe, Reliable and Enduring structures efficiently. Leading global supplier of precast accessories. Attractive Employer for talent across the globe. It is our strong value system which forms the basis of our success in developing long-lasting trust-worthy relations with our clients for over 30 years. Innovation – Improving our products, services and processes to bring added value to customers. Customer Satisfaction – Promoting a consumer-driven culture by considering our customers in all we do. People – People are our greatest assets. Quality – Uncompromising commitment to the highest standards. We insist on holding ourselves and all we do to the highest standard or quality. Both in the way we build our relationships and build our structures. The RSTEEL® brand emerged from a vision of building a safer and more responsible future for the industry. Started by Repo family,the company manufactured and sold precast concrete elements and ready-mix concrete through its production plants in Savonlinna and Savonranta, in Finland. Accessing the increasing demand of high quality and reliable metal components in construction industry, the company ventured into manufacturing and supplying precast accessories and concrete connections through its brand RSTEEL®. Building upon the expertise of being the end users of these solutions, the company has subsequently grown into one of the best metal and connection solutions in the industry. As one of the leading building components manufacturer and supplier, we are committed to being at the forefront of technology and innovation, delivering superior quality solutions with maximized cost efficiencies. With our range of industry-leading solutions for the global construction industry, we sell efficient solutions, always expanding our international presence to the markets around the world. 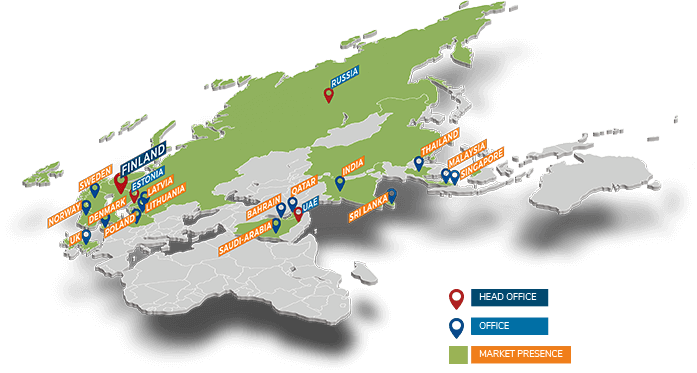 Through our offices in Finland, Estonia, Russia and UAE, and our network of Sales Managers in four continents,we deliver products and services that meet the unique and challenging requirements of our customers in more than 20 countries. Confirmation of excellence for our customers and business partners. RSTEEL® has earned the best possible credit worthiness AAA certificate. Only 2,6% of Finnish companies are entitled to carry this rating, and is a testament to our credibility and reliability. It is the strongest rating in Finland, earned through good payment behavior and excellent financial figures, and promises that dealings with our company are always on a steady and reliable foundation. The Strongest in Finland -certificate is a proof of the company’s excellent financial figures and credit rating, positive background information and good payment behavior. The credit classification tells the customers, partners, credit lenders and other stakeholders that cooperation with the company is on a steady and reliable foundation.